Future Leaders Program participants, Sylvia Gemung and Elisha Peono. Emerging public sector leaders participating in the Pacific Leadership and Governance Precinct’s Future Leaders program believe they can advance employment opportunities for women throughout the country. The Future Leaders program is supporting public servants to improve their technical and leadership skills, and to become champions of key policies in the Government of Papua New Guinea, such as the Gender Equity and Social Inclusion (GESI) policy. 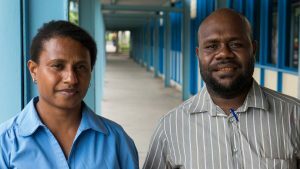 Elisha Peono, a GESI officer with the East New Britain Provincial Health Authority, said the Future Leaders Program is helping to develop strong and ethical leaders that can create more opportunities for marginalised groups in Papua New Guinea. “The Future Leaders Program is a good combination of the theoretical and practical aspects, and taking part will help me realise my potential,” Mr Peono said. The Precinct is a partnership between Papua New Guinea and Australia to develop capable and ethical public sector leaders who will be able to lead and manage the delivery of fair and impartial government services for all citizens of Papua New Guinea. The Department of Personnel Management is currently reviewing applications for the second cohort of the Future Leaders program, which is scheduled to begin in May of this year. Sylvia Gemung, a women’s officer with the Morobe Provincial Administration, said the Future Leaders Program will help her take the step up. “The Papua New Guinea and Australian Governments are looking at empowering women and getting them active in the upper levels of the public sector,” Ms Gemung said. “I’m challenged and inspired, and I believe in my heart that after completing this training there will be room for me to get up there. The Future Leaders Program has been created specifically for the Papua New Guinea public sector and is based on Ethics and Values-Based Executive Leadership and Management Capability Framework and the Gender Equity and Social Inclusion Policy. Applicants are awarded places on merit through a competitive assessment process. It is delivered in collaboration with the University of Papua New Guinea, the Papua New Guinea Institute of Public Administration and the University of Queensland, under the guidance of the Department of Personnel Management and the Department of Higher Education, Research, Science and Technology. Participants undertake a combination of skills-based training, peer-to-peer learning, participatory exercises, class discussions, academic course work, and workplace projects.